Flannery O’Connor once wrote that “the human being is always something under construction.” I am frequently reminded of just how true this is, even for someone who has been under construction for more than six decades. My most recent reminder happened two days ago. I limited my commentary on the picture to three words: “Got that right.” And the likes, emoticons, and comments started pouring in. We’re all allowed to hate privileged, moronic bigots. 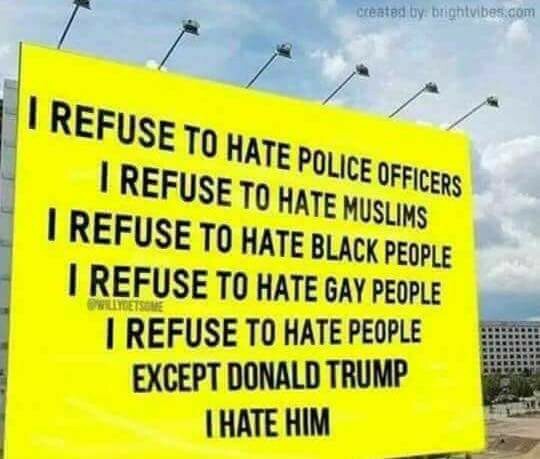 I rarely hate, but I hate Donald Trump. If he was just pathetic that would be one thing, but he’s exploiting everything and everybody, destroying every characteristic of sound government and humanity. I refuse to believe he’s just being manipulated. Him: “Hate” is an interesting word. One may be odious without being hated. The hater reveals more of her/himself than of the hated. There are many “pathetic” people though one wonders why they might be “hated” as opposed to being sympathized with. Me: I’m not proud of being a hater when it comes to Trump. But I am one. I bothers me because he is perhaps the first person I’ve said that about since Ronald Reagan when I was much younger and stupider. Him: My greatest culture hero, Jonathan Swift, an Anglican Dean, was a great hater, but he hardly picked on the pathetic. Me: Saying I hate Trump is hardly picking on him. Nor is his being pathetic a reason to pity him when he occupies the most powerful position in the world. Him: You should not hate anyone! I am appalled!! Me: I’m a human being—so sue me! Him: No need to sue you, I have plenty of money, and besides I still love you and your family! Then, of course, there’s always the killjoy who just has to play the Christian card (I hate it when someone does that). Her: Frankly, that’s just plain wrong. As Christians, we’re not supposed to hate anyone, but to love and pray for everyone, even our worst enemies. Seriously, people have forgiven people personally murdering their family or torturing them; Christ forgive his own killers on the cross. I do think as Christians we can learn to see Christ in the likes of Donald Trump. Otherwise, we’re failing miserably. And no, it doesn’t have to do with politics. I did not vote for the man, but I do pray for him and recognize our shared humanity. Me: Congratulations on being a better Christian than I am. My snarky response aside, I knew this one was coming. I take my faith seriously and am fully aware that coming out as a “hater”—even of someone like Donald Trump—“outs” me as a hypocrite, a weak Christian, or both. Guilty as charged. Her: I don’t think it’s a matter of being “better”; it’s just a process we all should be striving towards in our imitation of Christ. I know people who alternately act the same way about Hillary Clinton and those on her side of the political fence . . . Our faith is supposed to be stronger than our politics in such matters. We are supposed to love unconditionally, especially those who we naturally find repugnant or distasteful. If we can’t do it with politicians (and mind, I personally don’t like either Trump or Clinton), how will we ever handle people who seriously hurt us or those we love on a personal level? Even if we don’t feel it, it can be a movement of the will to embrace something higher than ourselves. Me: I do strive for it and am very aware of the challenges of living out my faith rather than just talking or writing about it. My faith is “supposed to be stronger” in such matters–I agree. I’m also willing to be honest about my regular failure to live up to that, as well as about the times I think I’ve lived it out well for a day. Her: That’s well and good, but the sign above can come off as something of a “positive” statement, to make Trump seem like the sole “unlovable” dehumanized being, and getting people to sympathize with that. In that way, it’s toxic. Me: Give me a break. I’m really not particularly interested in twisting something that is pretty clear in its meaning–whether or not you happen to agree with it–into its complete opposite. Have a good one. Mercifully, she didn’t respond, my suggestion that she is a better Christian than I am having been completely confirmed. My primary reason for sharing the picture of the billboard was that I thought it was funny (and still do). But the subsequent exchanges do raise an important question—why am I a hater when it comes to Donald Trump? Why am I willing to admit it in public and double-down on it when someone points out that being a hater is incompatible with many of the most important things I believe? A couple of strategies come to mind. I could take the sanctimonious route that I learned as a kid and say “what I really mean is that I hate the sin but love the sinner.” It’s not so much Donald that I hate, in other words, as the things he does and stands for. But that strategy is a cop-out. Paul Ryan, Mitch McConnell, John Boehner, and any number of others have stood for and do stand for things that I hate, but I don’t hate the person. In Donald’s case, it seems personal. Even when he accidentally does something I agree with—like siding with the Democrats once or twice—I still hate him. In his case, I hate both the sin and the sinner. Or I could take a different sanctimonious route and say that this isn’t “hate”—it’s “righteous indignation.” That’s how we used to get Jesus off the hook for losing it in the temple and throwing the moneychangers out. Certainly Jesus didn’t “hate” them—or did he? Actually, Jesus is reported to have said some pretty hateful things about a number of people, many of whom I’m sure were just doing their jobs and what they were convinced was the right thing. Anyways, what I feel concerning Donald Trump doesn’t strike me as “righteous indignation.” It strikes me as hate. And to make it even worse, I don’t feel a shred of guilt about it. Those who know me well and/or read this blog regularly know that I am not a hater by nature. That’s how I know that this is truly hatred—I experience the feeling so seldom that there is no mistaking it when it shows up. There’s no other way to explain my rising blood pressure and the pain deep in my gut every time I hear or see him on television or radio. I don’t like carrying hatred around. Hating someone is exhausting—it wastes psychological and emotional resources that are better used elsewhere. So I could try to be a better Christian, as my Facebook conversation partner suggests. I should love and forgive everybody—that’s what Jesus did. “Christ forgive his own killers on the cross,” I was reminded in that conversation. The problem is, I’m not Jesus. I’m me. I’m a flawed, imperfect human being who is committed to trying to live according to principles that are impossible to live by. As I talked about this and more with Jeanne (who also hates Donald Trump) at lunch today, she reminded me of something that I occasionally almost forget in my forays into more and more progressive and liberal Christianity—no one can live according to the principles and requirements of the Gospels. No one can live the Christian life. It’s impossible. The good news is that the whole point of the Christian faith, of following Jesus, is that it can’t be done by simply trying hard, even with the best of intentions. Call it what you will—human nature, original sin, natural weakness—but we all need help. And help is available—that’s the good news, the gospel, that Jesus delivered on a regular basis and that is still operative now. I am indeed something under construction, and sometimes what needs fixing or improvement has to be handed over to someone with both intimate knowledge of what it’s like to be human and the tools to keep working on daily imperfections. My hatred of Donald Trump happens to be a particularly stubborn example—and until someone does something about it, I’m okay with that. This entry was posted in Uncategorized on September 24, 2017 by vancemorgan. May I say, [This] was awesome. You are not only an exquisite writer, you took my thoughts right out of my mouth. You presented your state of mind perfectly, and I empathize with every part of it. Chances are good I’m older than you, and if I may, I’d like to lift the curtain on what another decade contributes to this scenario. Yesterday was high anxiety for me. I’d been yelling, being petty, controlling, annoyed. In a moment of self reflection, I was chagrin. I went straight to the Lord and offered up my shortcomings along with my apologies. The Lord said, JUST HOW GOOD DO YOU NEED TO BE BEFORE YOU CAN ACCEPT YOURSELF? I ACCEPTED YOU AS YOU ARE. YOU DONT NEED TO IMPROVE, OR BE BETTER ON MY ACCOUNT. I LOVE EXACTLY YOU. Encounters of this sort typically leave me in a heightened state for a while. Sometimes for ever. In that moment, I got it. I understood. If the Lord can love me as I am, I should be able to LOVE & accept myself, and feel free to express my whole self as I’m moved to do. I ACCEPT MYSEL. I HATE TRUMP…THOROUGHLY. YET I CAN STILL SEE THE GOOD IN ALL OF IT. SO MUCH SO, ITS ACTUALL FUNNY. HATE IS PUNISHING YOURSELF FOR SOMEONE ELSES BEHAVIOR. IF YOU REALLY HATE HIM—LAUGH AT HIM. THAT HURTS HIM MORE….AND YOU LESS. Your vitriol, well written as it is, will not defeat him, but with your skill you could turn a phrase, a catchy one, that belittles him with such corn, even his own supporters won’t resist guoteing it. Lol.